The Daily Currents , the ship’s daily, shares information either about the places we are visiting or on sea days gives general information about the world. Today it has to do with continents, and I found it very interesting so I am recording for my future information. The term continent is used to differentiate between various large areas of the earth into which the land surface is divided so a continent is a large continuous area of land on earth. All continents constitute less than one-third of the earth's surface which means that more than two-thirds is covered with water. We have been taught in school that there are five continents however there is no standard definition for the number of continents. By most standards there are a maximum of seven continents---Africa, Antarctica, Asia, Australia/Oceania. Europe. North America and South America. Asia is the largest continent in both area and population. En route to Mayotte, French Comoros, and yes, there are English Comoros. 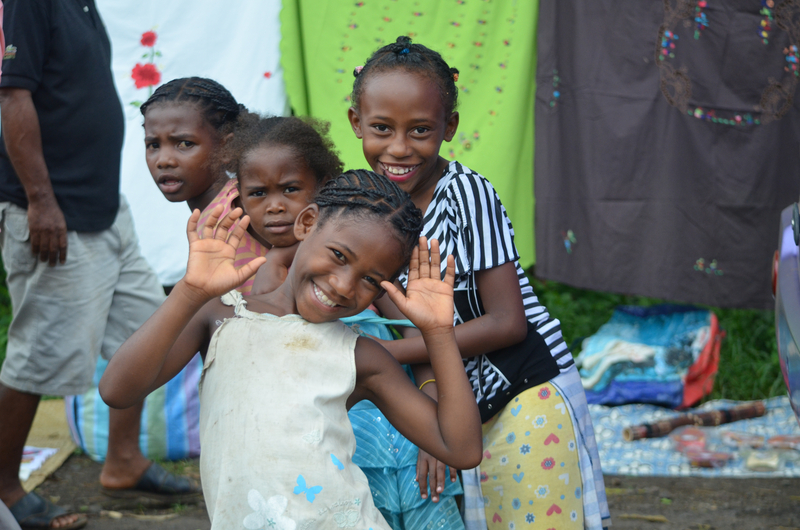 The Comoros are islands in the Indian Ocean between Madagascar and Mozambique. The English Comoros voted for independence from France and are their own country, but in1974 this territory known by its native name Mahore French Comoros elected to stay a French territory. Can it really be New Years Eve, and here we are in French Comoros??? It is my first time out of the US for New Years. Since I usually have a dinner at my house, I am happy to know that someone will be cooking and washing the dishes for me this year. Mayotte is the main city of French Comoros. French is the official language, but most of the older people do not speak it. French is now taught in school and the young people are sparking it along with Shimaore, the native language. The main religion is Islam, 97% with only 3% Christian. There are about 90,000 inhabitants. The island is not very developed and everything looked very economically deprived. The people live in very rustic houses. One of the major products is perfume from the Ylang Ylang tree which is made from a vey nice flower. I believe I am correct in saying that all the perfume for Guerlain is made here. We visited a very rustic Yland Museum and drove to the Bandrele Salt Factory which was a very primitive operation. 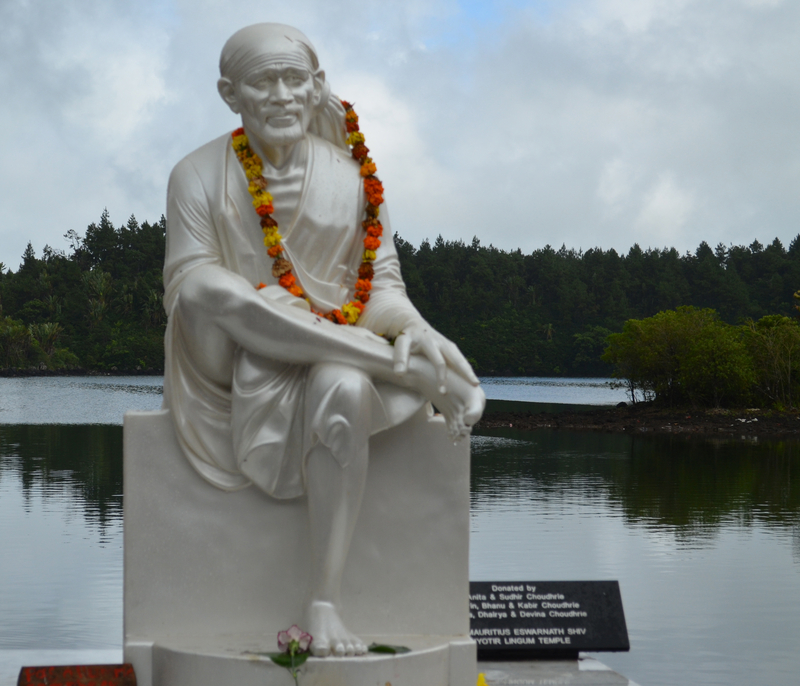 We were happy to see a more progressive one in Mauritius. As we left, we experienced a malfunction of the back door and no efforts to close it worked. So, eventually it was tied shut and Terry Bishop, one of the on board lecturers, who was the tour leaders, had to sit and hold it closed. That, however, did not stop the loud beeping that shows malfunctions. I must say it did provide much merriment for those sitting In the back of the bus. 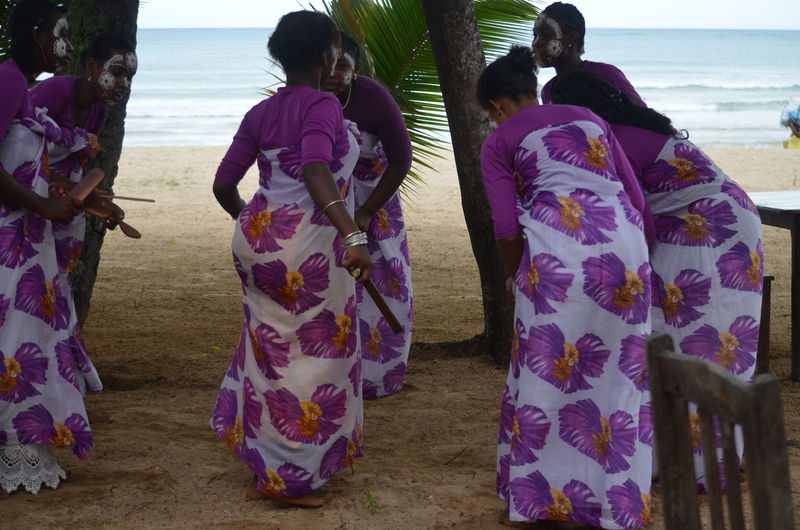 On to O'Olo beach for refreshments and a folk dancing demonstration. It was a nice setting at the beach, but since then we have seem many more beautiful beaches. So is on back to the ship with expectations of a bang up New Years Eve. We're we disappointed!!! I guess it is hard to do something in the dining room as there is open seating. There was a show, but Cecilia and I left before midnight as we had to be ready to leave for our Madagascar tour at 7:00 am. Not good planning for a New Year’s Day! Hard to believe that it really is 2012. 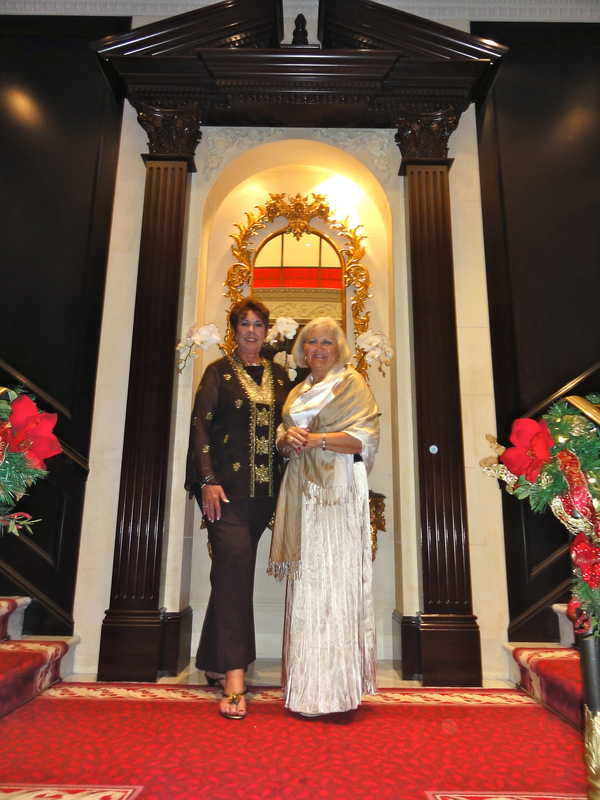 Cecilia and I would never have dreamed that we would be celebrating 2012 in Madagascar in the Indian Ocean. 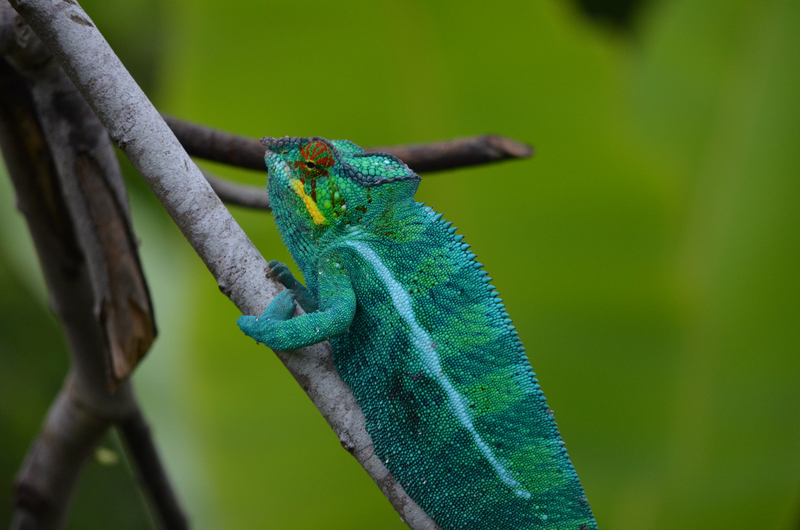 Nosy Be is the largest island of Madagascar and is the busiest tourist resort. It has a area of about 187 square miles and it's population was officially estimated at 36,636 in 2011. Nosy Be means big island in Malagsay. It has been given several nicknames over the centuries, including "Nosy Manitra", the scented island. Nosy Be is a volcanic island that reaches its highest peak at Mont Lokobe, 1476 feet. 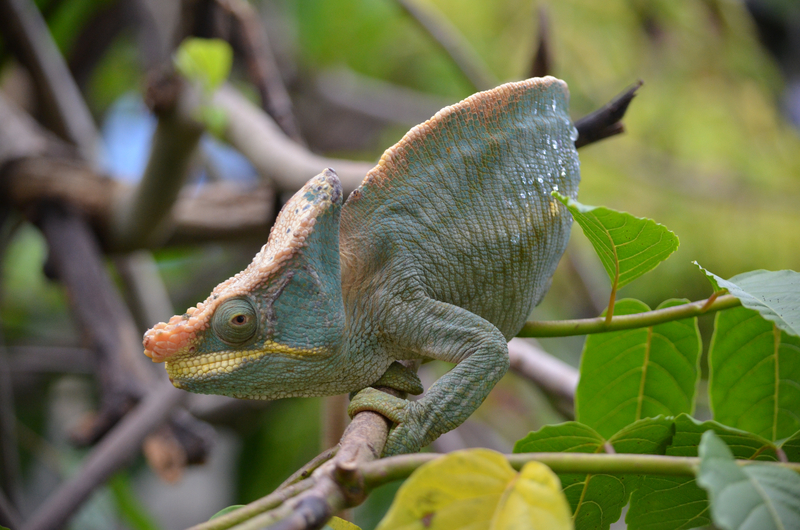 The island is known for having the world's smallest frog and chameleon. The population is mixed Asian and African origin. The language is Malagasy. English is becoming more widely spoken. Nosy Be reminds me of Zanzibar. It has a “shabby sheick" charm. Most of the houses are very primitive made from parts of the traveling palm but they are constructed in a charming way with thatched roofs. We drove to Hellville Port to a local market that had many beautiful fruits and vegetables, many of which were foreign to us. The climate is tropical and the plants and vegetables grow in abundance. Our guide says that no one here goes hungry as many of the fruits and vegetables grow wild. We went to another Ylang Ylang distillery, this one much more modern. The Ylang Ylang tree is an interesting one. It would be difficult to describe. The flower is used for the perfume and has a wonderful odor. 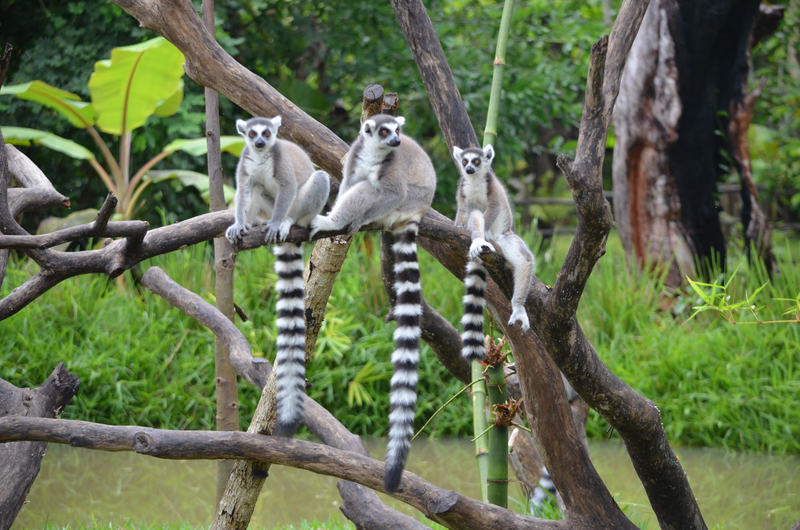 Having some knee pain I skipped the walk through the gardens and therefore missed what I had really wanted to see, the lemurs for which Madagascar is famous. They are lovely little creatures that live in trees and can be described as a cross between a monkey and a squirrel. We then drove through the country side to a local village which probably looks the same as it did 100 years ago except of course there were TV antennas and some people had cell phones. There are some nice beaches, and we went to Andilana beach for refreshments. The ladies on the island do beautiful embroidery work and one of the main products from that is beautiful table cloths. Cecilia bought a beautiful one as did most of the other ladies. Since they have to be ironedI resisted their beauty. Even with the poverty, there is a distinct charm to Nosy Be. The people are warm and friendly and the landscape lush and colorful. I sure do not want to live there but it is an interesting place to visit! After visiting all these islands we return to a Five Star Ship that has every possible amenity and feel so fortunate that we not born in these islands. It is hard to believe that 2012 has rolled around but here we were celebrating New Year's Eve cruising the Indian Ocean and yesterday (New Year's Day) we had to be ready to go on tour at 7:00 AM. Between tours and activities on the ship there is not much time to write. Cecilia is doing a better job organizaging pictures than I am keeping account of our travels. She is posting the best pictures under both of our names on Facebook so I hope you will have a look. What a lovely day! If Reunion looked like a mountain rising out of the Indian Ocean, Mauritius looked like Mt. Everest rising out of the sea. This is very dramatic scenery and looking down from the top of a very high volcanic mountain the sea is full of different shades of blue and turquoise. 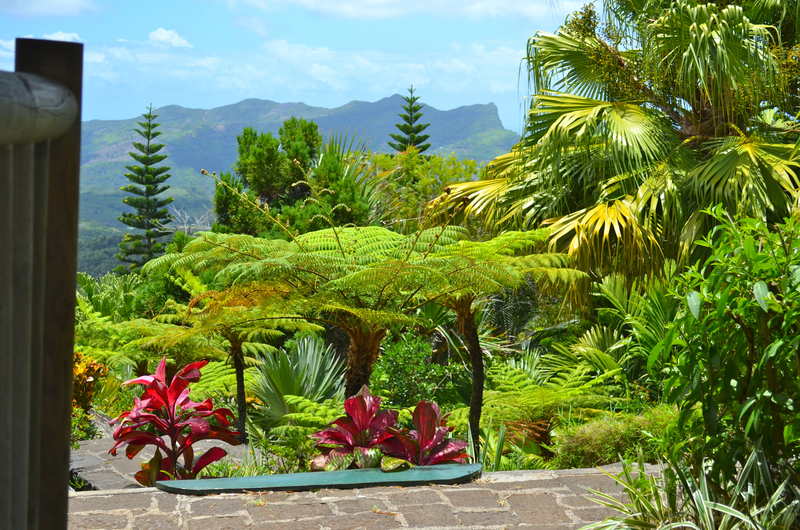 The extinct volcano is Trou aux Cerfs and it has beautiful views all over the island. The roads are not for the faint of heart or those who suffer from motion sickness as they are very winding. You meet yourself coming and going around curves especially in large buses. Port Louis was already used as a harbor in 1638. The population is now largely made up of the descendants of laborers, who were hired from India in the 19th Century. They are Hindus and Muslims primarily. We went to two very elaborate Hindu temples. 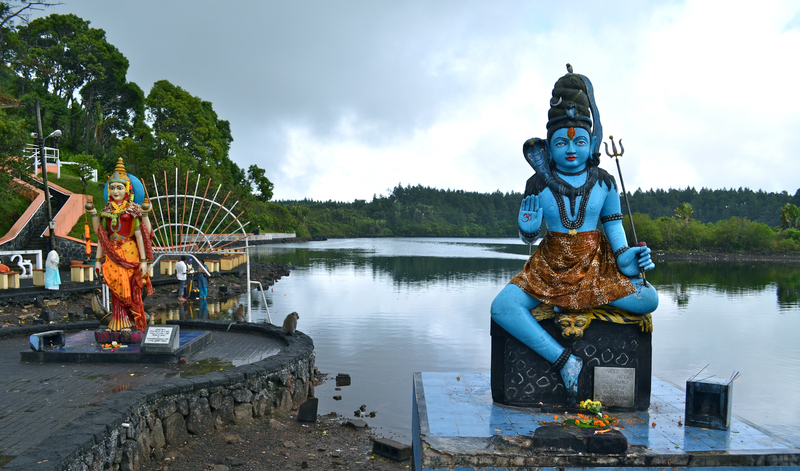 We visited Grand-Bassinet sacred lake and a pilgrimage place for all Hindus here. For the celebration of Shiva half a million Hindus on the Island make the pilgrimage to the Shrine and there is a special large sidewalk being constructed so the auto traffic can be avoided. We drove to the Black River George's view point, a beautiful vista, and then we were off to lunch at a local restaurant serving local food overlooking the Black River George, a lovely spot. It was a mix of curry and the local vegetables. After lunch we drove to the Chamarel which was very scenic but not comparable to the ones we saw yesterday in Reunuion. We also saw the Seven Colored Earth which is layers of lava flow from the volcano. There are definitely 7 colors and it is said if you mix the lava together it will still separate into the different colors. 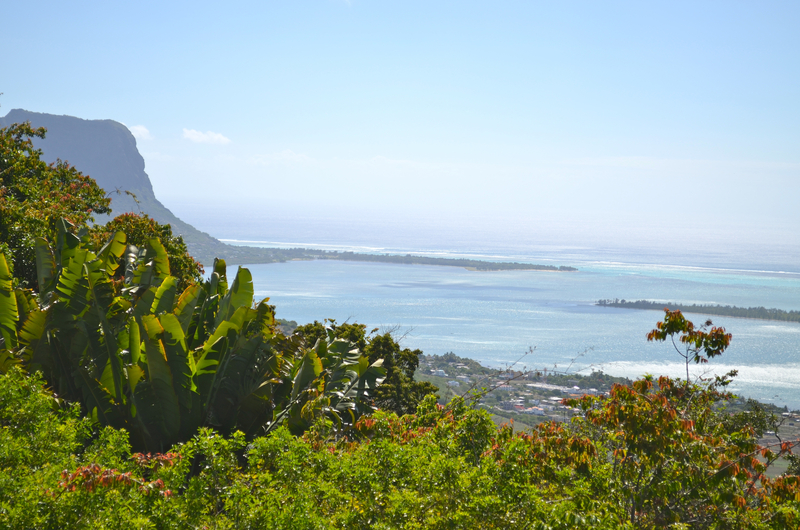 We came through the Le Morne Mountains with another beautiful vista of the sea. On the way back to the ship we passed fishing villages and famous salt pans of the Black River. This island is very modern, has some really new and very nice shopping Malls, much like we have at home. We drove through a very exclusive housing area, some with helipads. We did not see the fancy beach hotels but they are here. I saw a Club Med van but I suspect that the clients are mostly French. These islands are a vacation spot for the French. I always judge a place by saying if I had to live here, could I?? Well, I think I could for a short period of time. It was a very good day and now we are off for two days at sea to relax and catch up on our sleep. Next stop The Seychelles! PS on Reunion. The island gets 24 feet of rain a year. We arrived in Mahe, with an accent over the e. It is the largest island (59.8 square miles) of the Schyelles. There are only two stop lights in town, and it is definitely a challenge to cross the street as no one seems to stop for pedestrians. Even with only two stop lights the town is very modern compared to the other islands. The local economy seems to support the people and we were told that there is no unemployment. Everyone had a job. The capital city is Victoria. It was a French possession until 1812 when it became a British Colony and remained so until 1976 when it became an independent nation. Forming the backbone of the island is a specular mountain range that includes Morne Seychellois, the highest peak offering stunning scenery. More than 60 beaches fringed with swaying palm trees can be found along the shore line. The languages are Creole, English and French. There is compulsory education from age 4-15, and the students must learn English. We took a ship tour which included the National Botanical Garden which had beautiful plants, many of which we have in Florida, but ours do not grow as lush and large as the plants do here. We then had a walk through the small shopping district and through the market. The market consisted of trucks being backed along two sides of the street, and the vendors were selling fruits and veggies from the trucks. The largest crowd was at the egg truck where people bought eggs and put them in loose plastic bags. I wonder how they got home without breaking them. We then drove around the island on very narrow and winding roads and took in the stunning scenery from the top of the mountain and stopped at a resort on Beau Vallon Bay with a beautiful beach. The water was a lovely clear blue and it was white powder sand. Many of the group went swimming and it was very inviting but because of my knee I enjoyed it from the comfort of a chair. After time to enjoy the beach we continued our tour of the island. It really is a very beautiful island and lives up to it's reputation as a vacation paradise. The tourists are mostly French, German and Italians as is true of all the islands in this part of the world. Some of our Caribbean islands are equally as beautiful even if not as mountainous and are certainly much closer. This morning we woke up, looked out and saw one of the most beautiful vistas in the world. We were surrounded by small mountainous islands and the some of the most beautiful water I have ever seen. The water is comparable to some of the Greek Islands. While Seychelles has forged ahead to join the ranks of the world's developed nations- and today boasts the health, education and communication infrastructure to prove it- La Digue has managed to retain the Creole identify and traditions which have created it's island way of life. It is a timeless oasis, hidden away in the vast expanse of the Indian Ocean, guarded by azure waters and fringed by teeming reefs, La Digue is the Seychelles of yesterday, which lures visitors from around the world and welcomes them with smiles, warmth and color. The earliest settlers claimed to have discovered The Garden of Eden. It has the most beautiful beaches in the country which is made up of many islands. It is said that La Digue has the friendliest people and most tranquil, serene and relaxing atmosphere in Seychelles. Cars are shunned in favor of bicycles and ox-carts. La Digue is more than just an island, it is a way of life and offers a traditional Creole experience unchanged for generations. Our guide, Bradley, a mix of Indian and African said that everyone knows everyone. There are 2500-3000 inhabitants. I tendered in and hired a truck with some others for a 2 hour tour around the island.. We followed the beach road to its end on one side of the island and then went on the other side to one of the most beautiful beaches I have ever seen... Anase Gaulettes....Fabulous beach ringed by huge volcanic boulders and water so beautiful it takes the breath away. It is Sunday and everything is closed. In keeping with the attitude of the island, it seems that the shop keepers could care less that there up is a cruise ship in town. Cecilia's tour began from the jetty by camionette to L'Union Estate for a glimpse of plantation life, the production of vanilla and coconut oil. 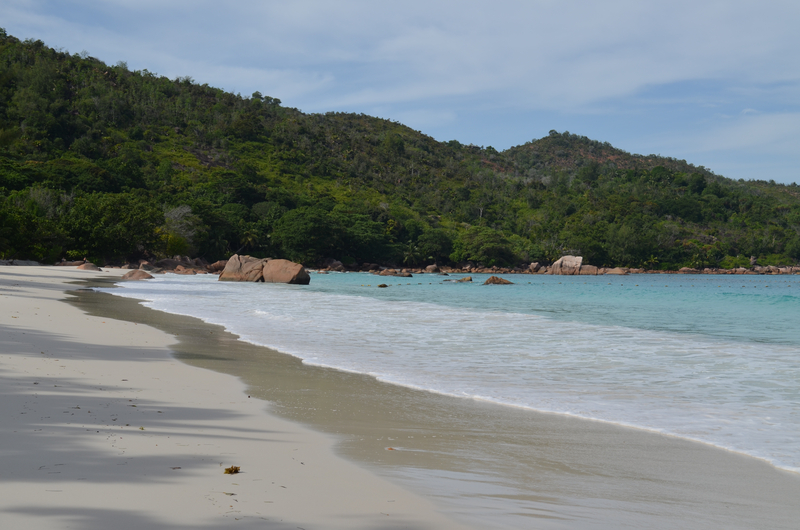 There was a picturesque ride through the village of La Passé and swimming at Anse Source D'Argent, one of the most magnificent beaches in the world! Return to the jetty was by ox cart; a little bumpy, but a lot of laughs. Her driver was fast—and they beat the others back to the jetty. to be the first the driver jumped down and started running along beside the ox and encouraging more speed. The poor ox was in a huff by the time they arrived. We have definately spent a day in a beautiful place. This morning we woke up anchored off the coast of Praslin, our third and last island to visit in the Schyelles. The island is about 38 square kilometers in area, 7.5 miles long and 3 miles wide and has about 5000 inhabitants. It is a paradise for those who love nature. It is not overly developed and the people are friendly and easy going. There are not many shops and there are a few resorts that look very nice. There is a huge Raffles Development that looks like condos. We do not know if it is connected to the Raffles Hotel or not. Along the beaches are big rocks and the island is surrounded with coral reefs teeming with aquatic life. The center of the island is a large virgin forest. Some of the rarest birds live on the island. Two are the fruit pigeon and the black parrot. Unfortunately we saw neither. There are many beautiful beaches covered with soft, white sand. Anse Lazio is the most famous. It was recently voted one of the top ten beaches in the world. 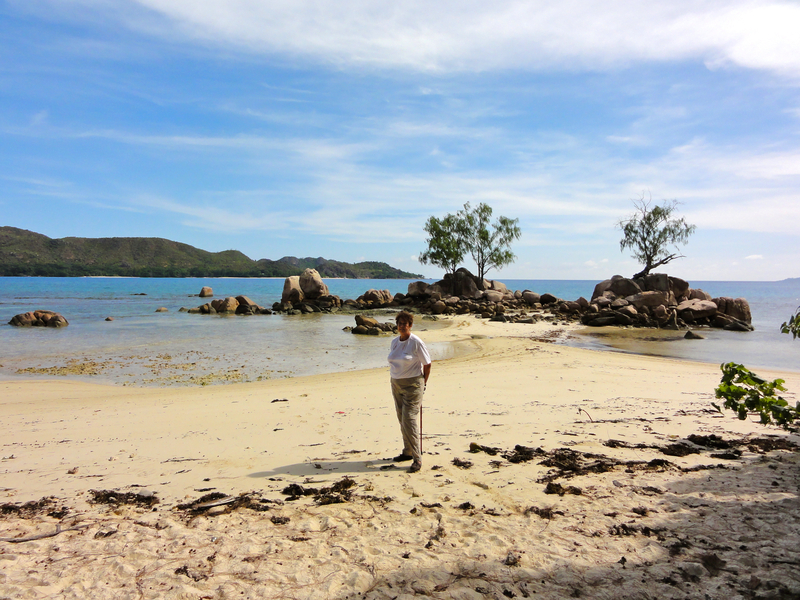 Large granite boulders shelter its white sandy beaches and bright blue waters. Cote d'Oris also very popular. In addition to the coral reefs there are nearly 1,000 varieties of fish. It is the only island of the Schyelles to have a golf club and casino. 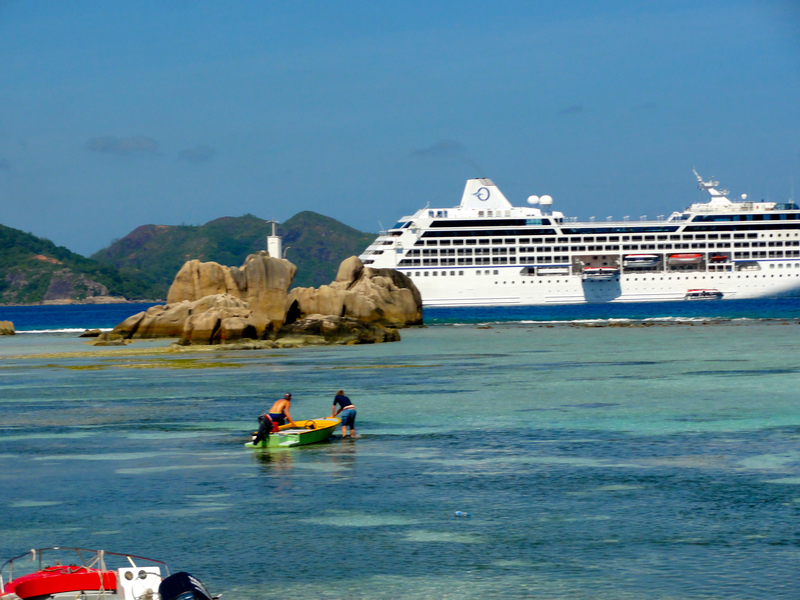 Praslin strikes the balance between commercial development and respect for the ecosystem. The overall feeling of the island is peaceful and relaxed. Our description said that it is so beautiful that people who visit say once they leave, they feel like they have to come back- if only to prove to themselves that such a magically beautiful place exists really exists outside of dreams. It is a pretty island but I would not say it is magically beautiful. My picks would still be Reunion for the lushness and modern conveniences and La Digue for the atmosphere and beaches although Anse Lazio is the prettiest beach of them all. We hired a taxi and drove the length of the island , stopping at all the beaches for pictures and drove by the Vallee de Mai National Park which is a palm rainforest. We did see a a waterfall. It is too bad that I could not enjoy the beautiful azure water and the lovely beaches because of my knee but it was great to realize how beautiful this part of the world is. I would say again that there are comparable islands in the Caribbean. The economy in these islands have a long way to go to catch with the major Caribbean Islands. They are islands where one checks into a lovely resort, stays put and enjoys the beach and water. We have two days at sea and the next stop is the Maldives.